A quiet place, a memory space. 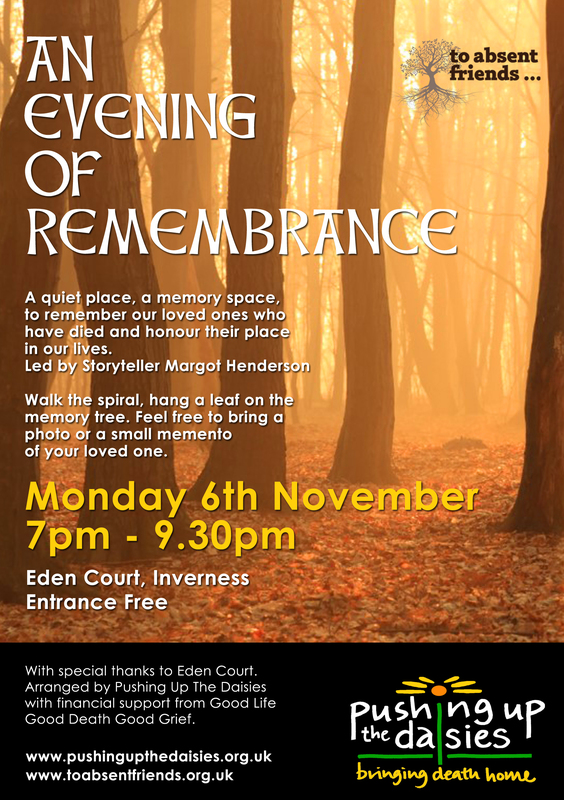 This will be an evening to remember our loved ones who have died, how they shaped our lives and their continuing place in our lives now. A reflective and uplifting evening of storytelling and gentle activities. The evening will begin with inspiration from poet and storyteller Margot Henderson. We will then have a chance to hang a memory on the memory tree, light a candle, walk the spiral. People will be free to share, or sit quietly in our company to reflect on their memories. There will be a space for small mementoes we can bring along – a photo, a book, a song – which capture the essence of the person for us. Free entry, but please register if possible through info@pushingupthedaisies.org.uk or 0300 102 4444.